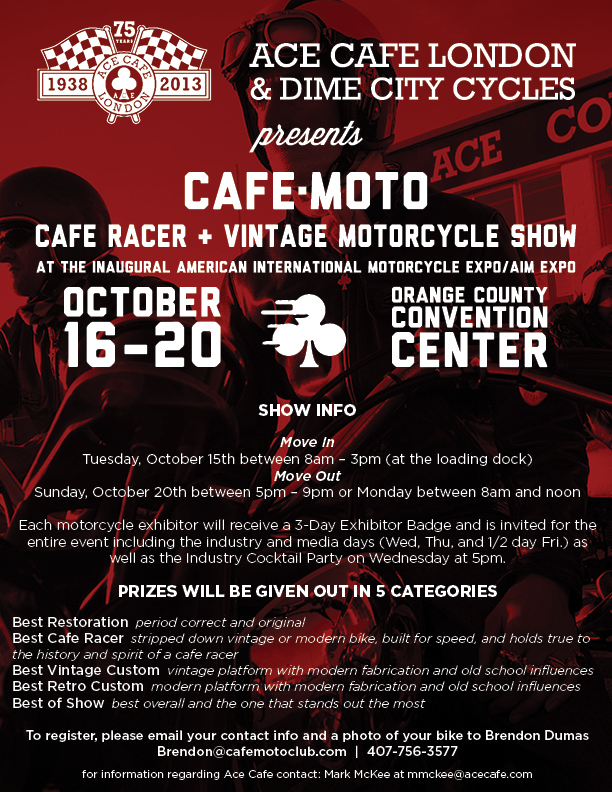 We now have teamed up with ACE Cafe and Dime City Cycles to host the first ever Cafe Racer & Vintage Motorcycle Show @ the AIM Expo. 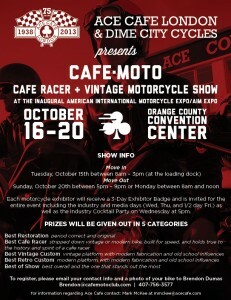 We are looking for purpose built bikes to enter into the show. It’s Free, you get free exhibitor entry to the show and you can have a chance to win a trophy and prizes! Please click on the photo below for more information. Cafe-Moto hosts Distinguished Gentleman’s Ride and Base Camp cancer benefit this Sunday! The Distinguished Gentleman’s Ride is all about dapper, classic bikes, laughter and men. It is a motorcycle ride that takes place in over 110 cities worldwide on the exact same day. It is the only event of its kind and all spawned from a single image of a gentleman on a motorcycle in a suit. Kickstands are up at 10am at the Zilly Bee Cafe in downtown Orlando and from there you’ll be taken on a 55 mile journey that should last anywhere between 2-3 hours. Check out the route map! Afterwards everyone will rendezvous at Cafe-Moto’s watering hole Sandwich Bar for an after party and raffle to benefit Base Camp Children’s Cancer Foundation. For all of the details and to RSVP for the ride head over to our Meetup page! Welcome to the all new Cafe-Moto website! 2013 is and will be an exciting year. More rides, more events, more swag (shirts, patches, buttons, etc…) and more ways to connect and share what makes you a moto nut. If you are in the Central Florida or Tampa/St. Pete areas and would like to become a member, please visit www.Meetup.com/cafe-moto . Also please feel free to visit our new Instagram and Facebook accounts @Cafemotoclub. Please stay tuned to the site as we will be adding new info and swag soon! Thank you again for visiting! For more info contact Brendon@cafemotoclub.com.